The tug of kinship and the human frailties that undermine traditional family solidarity and values figure prominently in this interesting collection by the poet and memoirist (Life Work, 1993, etc.). Six stories of the twelve here are reprinted from The Ideal Bakery (1987). Of the original tales, the extremely sketchy “The Fifth Box” is an obvious fictionalization of the passing of Hall’s late wife poet Jane Kenyon—and three stories of varying quality record occasions in the life of presumably fictional alter ego David Bardo. “The Accident,” set in the early 1940s, observes David’s parents wasting their lives in weekend tavern-crawling, and suggests how his maturing is simultaneously a growing away from them. The ampler “Lake Paradise” details David’s separation from a girlfriend whose family incarnates working-class vulgarity, as his parents’ values control his actions. And “Roast Suckling Pig,” which finds David settled in domesticity and a diplomatic career, charts the course of his affair with a mercurial, flagrantly dishonest married woman (rather pointedly named Alma Trust). Two longer, more substantial stories examine the lingering effects of infidelity. “New England Primer” portrays the quiet heroism of its narrator’s father, a small-town physician who makes a new life for them both when David’s mother leaves them, stoically takes her back and surrenders his own happiness when she becomes widowed and ill, and—through the narrator’s intervention—is eventually reunited with the younger woman whom he had rescued from her malignant family. It’s overplotted, but undeniably affecting. 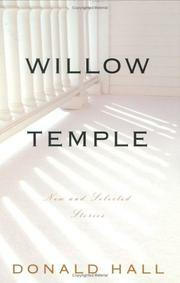 “From Willow Temple,” the best piece here, is a superb combination of reverie and unsparing self-analysis: an elderly woman’s acceptance of the respective failings of her straying mother and passionless father, as she understands how their imperfect marriage has shaped her own lifelong momentum toward frustration and loneliness. Understated lyricism very much in what William Carlos Williams (whom Hall often resembles) called the “American grain.” Moving and memorable.